Troy Caupain is an American professional basketball player who plays in the National Basketball Association (NBA). As of 2018, Troy Caupain Jr. currently plays for the Orlando Magic as their Guard. As a Guard, Troy Caupain Jr. reportedly earns around $77,250 dollars as his yearly salary from Orlando Magic. Since he just started his career in NBA, his net worth is yet to be reviewed. Troy Caupain Jr. was born on November 29, 1995, in New York City, New York to his mother, Renee. As per his nationality, he is American and belongs to Afro-American ethnic group. Further, his star sign is Sagittarius. Troy Caupain Jr. attended Cosby High School in Midlothian, Virginia where he played for his high school basketball team. Troy Caupain Jr., in his high school career, held an average of 26 points and 15.1 rebounds. After completing high school, Troy Caupain Jr. enrolled at the University of Cincinnati and played for the University of Cincinnati. Caupain signed a summer league contract with the Toronto Raptors after he was not drafted in the 2017 NBA draft. He received a training camp invitation from the Orlando Magic but was later waived. After some days, he was acquired by the Lakeland Magic of the NBA G League. He scored an average of 15.8 points, 7.5 rebounds, 5.7 assists and 1.4 steals in a total of 51 games. In April of 2018, Caupain signed with the G.S.A. Udine of the Italian Serie A2 Basket. He further signed a two-way contract with the Orland Magic for the 2018-19 NBA season. As per the deal, he will give time to both the Magic and their NBA G League affiliate, the Lakeland Magic. He currently plays for the Magic along with other players like Evan Fournier, Amile Jefferson, Mohamed Bamba, Jarell Martin, Jerian Grant, etc. Troy Caupain's personal life is quite secret since he has not revealed anything about dating affairs. There is no rumor regarding his dating or personal life. He currently seems to be single. Caupain often keeps posting photos of him playing basketball. This shows how much he is dedicated to the game. Therefore, we can conclude, Caupain is more focused in his NBA career than being in a relationship. 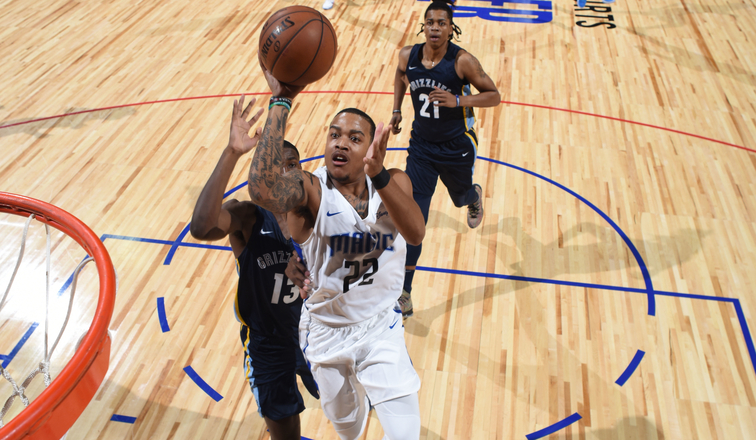 Troy Caupain Jr. signed a two-way contract with Orlando Magic in July 2018. Further, the NBA player has an average salary of $77,250 dollars annually. His net worth is yet to be estimated since he just started his career in NBA and yet to earn more money from playing the basketball. Other than being a famous NBA Guard, Troy Caupain Jr. is pretty famous in social media. He has 12.9k Instagram followers and 6.3k Twitter followers. Troy Caupain Jr. is not only a world-class athlete but also has a very attractive individual. The Famous NBA star is 6 feet 4 inches in height and weighs around 95 kg.